Guide entries for Series XI and XII brought up to date. Celebrating a decade since the Dave revival began! 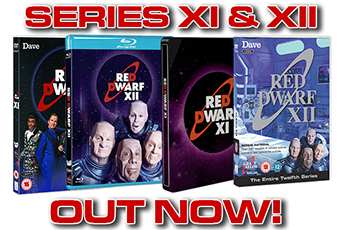 New Series I-VIII boxset, plus Series XI and XII, coming soon! 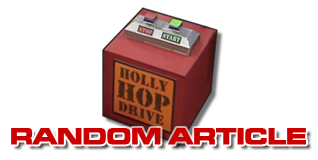 New pressing to correct error identified on the Red Dwarf I-VIII set. Red Dwarf novels get the Rule of Three podcast treatment. Guardian feature looks at Red Dwarf's journey off the ground. Live Red Dwarf screening and standup set in Prague! Watch Rob Grant's new show get recorded! The Fan Club convention sets a date. Your questions, newly answered and updated! 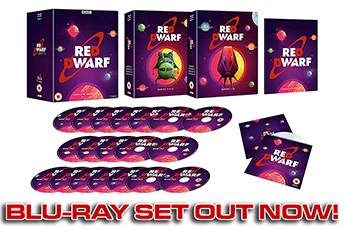 Looking back at Red Dwarf's home release art. The complete Series I-VIII in one high-definition boxset! Digging through the best finds in the new collected boxset. Running back through Red Dwarf's anniversary year.